Northland – New Zealand’s warmest, subtropical region – stretches from Mangawhai in the south to the country’s northernmost tip, Cape Reinga. Offering lifestyle and workstyle, Northland is attracting new investment and industry development. This growth complements a solid industry base of pastoral farming, horticulture, forestry and wood processing, and tourism. Other key sectors are floriculture, organics and the arts. Whangarei District has a deep water port which gives easy access to national and international markets and gives businesses an edge for commercial success over other New Zealand provincial cities. 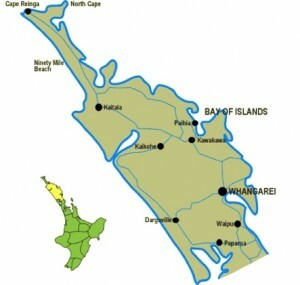 The region has twin, diverse coasts, with no part of Northland being further than 40 km away from coastline, pristine beaches, bays and harbours. Vast tracts of forest remain, home to 2000-year-old giant kauri trees. Today, Northland has a population base of more than 158,000, spread through urban and rural communities on a land area of 13,300 sq km. About 53,000 employees work for over 19,000 businesses and Northland’s gross regional product of $4.9 billion annually represents about 2.3% of the national total. The quality of life in the Northland region is a drawcard for many people who enjoy the outdoors, and a wide range of year round activities and scenic beauty.